Every year, usually around Christmas, I make a batch of mead. About a year later I bottle the mead and leave it to mature. The last couple of batches have been, if not spectacular, certainly very drinkable. I expect them to improve further with age 1 and so have tucked them away for special occasions over the next 12-18 months … or longer 2. Clearly this isn’t a quick process. The early batches I made were pretty rough. Some were ditched at – or rather just before – bottling. However, I’ve now settled on a recipe (which means found … I claim no originality for it) that has worked well for at least three batches in a row. You’ll need a small amount of equipment, all of which is readily available from a brewing and winemaking store. I’ve used Hop and Grape, but there is lots of choice online. In England, Wilkinsons is also a good source of inexpensive brewing supplies. 5g of good quality white wine yeast. I’ve had the most success with Lalvin D47. Prepare a mug of tea. Use boiling water and one tea bag, leave it to go cold and discard the tea bag. While it’s cooling prepare the yeast starter and sterilise everything. Add the yeast to a clean glass containing 100ml or so (quantity isn’t critical) of warm water at ~40°C. Stir to disperse the yeast and leave at room temperature to rehydrate. Add the honey to the saucepan and add about 2 pints of water. Warm over a gentle heat, stirring regularly to completely dissolve the honey. It doesn’t need to get hotter than ‘hand hot’. Once the honey is completely dissolved take the saucepan off the heat and allow to cool. While that’s happening prepare the demijohn. Thoroughly sterilise a demijohn. I use crushed Campden tablets as I’m ‘old skool’, there are probably newer and better ways to do this now. At the same time sterilise a rubber bung for the demijohn, a funnel and an airlock. Rinse the cleaned demijohn very well (tap water) and then add ~1 pint of bottled water. To this demijohn, using the funnel, add the honey mix, the cold tea, citric acid and the yeast nutrients. The temperature should now be around 30°C. Add the yeast starter. There will still be a considerable volume of the demijohn still empty (see the image above). Add the bung and, holding the bung tightly in place, shake the demijohn very vigorously. Replace the bung with an airlock part-filled with bottled water. Place the demijohn somewhere out of the way to ferment. The temperature (at least for Lalvin D47) needs to be 15-20°C but not any higher or it can produce ‘off’ flavours. 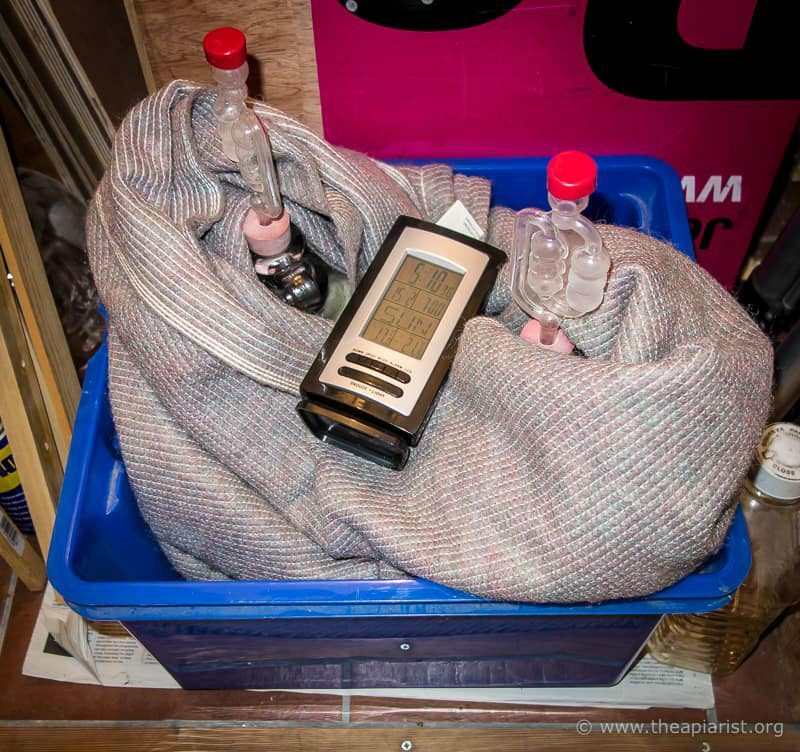 I wrap the demijohn in bubble wrap or old blankets to help keep the temperature stable 3. It needs to be out of the way as you don’t want to move it and disturb things during fermentation. Bubbles will start in 6-18 hours. Initial fermentation can be very vigorous which is why lots of headspace was left at the beginning. After 48-72 hours fermentation will have steadied to about one bubble every few seconds. The sound is hypnotic 🙂 Once fermentation has steadied remove the airlock, top up with water to within 1″ of the neck of the demijohn and replace the airlock. Let fermentation continue. After 2-3 months fermentation will have almost or completely stopped. The demijohn will have a thick layer of yeast settled at the bottom of the bottle. Avoiding the yeast layer, siphon the mead into a new, sterilised demijohn. Don’t disturb the yeast layer … don’t worry about not getting every last drop out of the demijohn. Top up the new demijohn with ~1:3 w/w honey in warm water (i.e. 227g of honey dissolved in 750ml of water). Replace the airlock. Fermentation will start again. Once fermentation has completely finished – this takes a variable length of time – the mead should be crystal clear 4. Bottle the mead. Test it (of course!) and leave it somewhere dark and cool to mature for several months. This is a very basic guide to making mead. That’s because, despite making it for a few years, I’m still very much a beginner. There are hundreds of guides and at least as many recipes online. Read a few, but then just have a go … don’t get bogged down in the minutiae. If you can’t find Lalvin D47 use generic white wine yeast. Use well-flavoured honey. Don’t use something bland or insipid. Many people use heather honey for mead though the best batches I’ve made have always been with a good midsummer mixed floral honey. Using the recipe above the last few batches have cleared perfectly. One or two early attempts remained cloudy after racking it off and I remedied this by adding a bit of bentonite. Whatever bottle style you use make sure it is made of clear glass … you want the lovely golden amber colour of the mead to shine through. I’ve no idea of the alcohol content as I’ve lost my hygrometer. Lalvin D47 can tolerate 14-16% alcohol which gives you an idea of the upper limit it will reach. I know the stuff I’ve made is reasonably potent. Test your mead in moderation. If you like the flavour I’d recommend NOT guzzling the entire bottle in one sitting … particularly if you use standard volume (75cl) wine bottles 5. Remember that you can’t sell alcohol without a licence. Actually, the mead prepared in 2015 has now all gone and was pretty good by the time I gave the last bottle away. I don’t drink all the mead two years after starting it … it keeps well, gets better with age and is pretty strong! This might not be needed in a house better insulated than mine i.e. most houses. I’ve sometimes forgotten it by this stage and it’s stood around for up to 12 months with no apparent ill-effects. 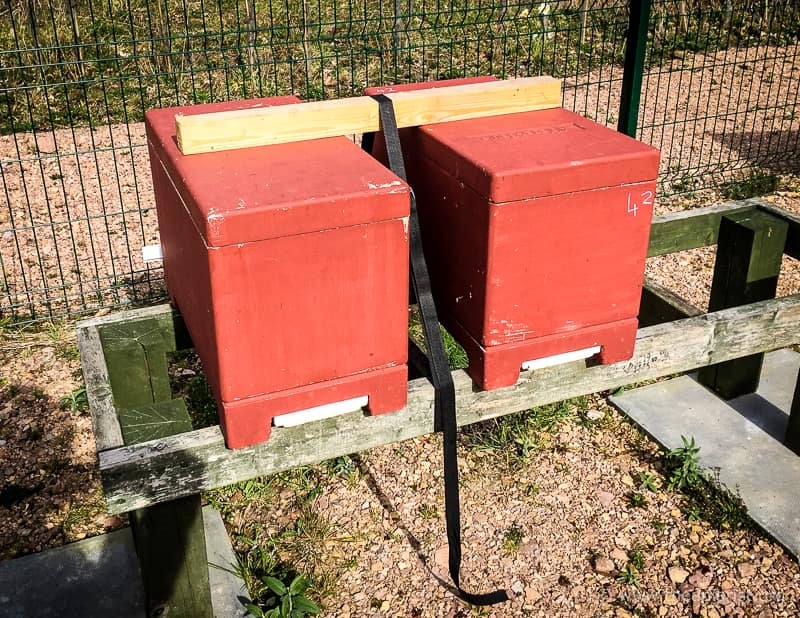 This entry was posted in Beekeeping, Honey and tagged Lalvin D47, monks, yeast on January 18, 2019 by David. Will this be a sweet or a dry mead? Hi Sally … sweet or medium sweet. Have you tried making sparkling mead? I bought some recently and it was pretty insipid. I’m sure it could be good. Just wondered. Never tried as I’m not a fan of sparkling drinks generally. I’ve read that the best way to achieve this reliably is by CO2 gassing. What grade of sweetness does this recipe produce? Hi David , great post! I would make the following recommendations. Use port wine yeast, it is most alcohol tolerant. Make up your yeast starter 3-4 days beforehand use a conservative free Apple juice to give the yeast a head start over the other yeasts in your unpasteurized honey. That way you will avoid bad ferments. I use about 250-300ml as a starter for 20l. For a 4,5l /1gallon ferment you can start the first 3 days in a honey bucket with the lid on loose- it doesn’t froth over and you can do your whole mix in one go (no back filling). You should not let it sit on it’s lees for too long, I take it of it’s sediment after the violent ferment is over then again after 6-8 weeks , maybe again after 4 months if it’s a slow one. This reduces off flavours. Generally 1,5kg honey:4,5l water is about right. I think good ariation is good but mixing well so no honey sinks to the bottom is v important , if honey sediments, when yeast gets near it, it is killed by osmosis that can stop a ferment in it’s tracks. There is a lot more I could write, but your eyes are starting to glaze already…. Excellent. That’s really useful information Calum. I did do a couple of early batches in a honey bucket to contain the first rush of fermentation. More recently I’ve done as described above and not had an issue, but I do have to top it up. Interesting that you rack it off two or even three times. Why apple juice for the yeast starter? Can you use a spoonful of honey instead? James (above) has asked about sparkling meads … have you made them? Thanks Calum … I’ll file that away for next Christmas when I make the next batch of mead. I’ve not checked the pH but, since honey is acidic, it certainly should be below 4.6 at the start at least. Later in fermentation the alcohol would stop growth I expect. I’m not aware of any cases of botulism linked to drinking mead. There have been cases from ‘pruno‘ – home-brew prepared in prisons. When checked, only something like 5-10% of honey samples contain botulinum spores … I really don’t think this is something to worry about. If the conditions were suitable for botulinum to grow it would probably be pretty awful mead! As a novice mead maker, I am wondering about the wild yeasts in honey, mentioned by Calum above. I have been bringing the honey and water mixture up to boiling point to kill off the wild yeasts, before adding the wine yeast starter. Should I not be doing this? Am I damaging the flavour of the end product? I also consider myself a novice … however, I’d avoid boiling the honey/water mix for exactly the reason you state; the loss of some of the subtle flavours. 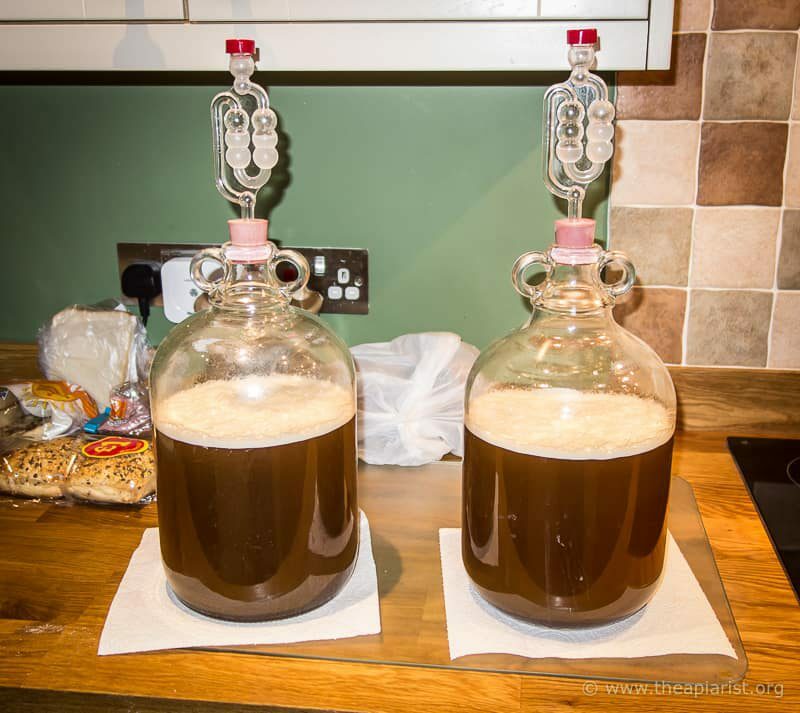 Calum’s suggestion of ensuring you start with a really healthy and strong yeast mix – to completely take over the fermentation from the outset – is a much better way of avoiding issues with wild yeasts. So, about 70ml for 5lt. Do you add water as well? I’ll let Calum add a response below if he reads this. I’d just mix yeast into the warmed apple juice and leave it somewhere reasonably warm, covered so ‘wild’ yeasts can’t get in, until you use it.